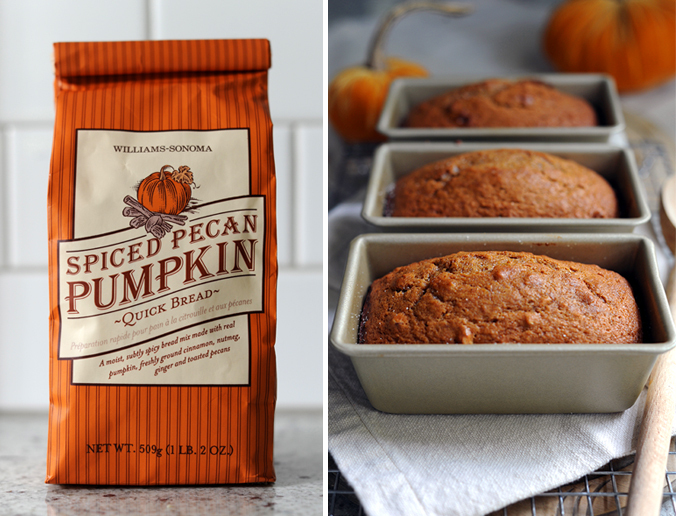 My friend Eve is addicted to Williams-Sonoma's Spiced Pecan Pumpkin Quick Bread. She texted me last week to see if I had a home-made recipe for the cult favorite because she is tired of paying a whopping $11.95 for a mix that makes one loaf. $12 (plus the cost of 2 eggs and a stick of butter) and you have to spend an hour making it? Why not just make it from scratch?! I have really never understood why people use mixes? Generally it is just as easy (and CHEAPER) to make it from scratch—plus, it's fresher, has less artificial ingredients and preservatives and you can alter for dietary restrictions. I took to the internet to find a recipe for her and none existed. Lots of pumpkin breads but I wanted it to taste EXACTLY like the William-Sonoma version. I went out and bought a mix (for $12 ugg), made it at home, studied the ingredients and flavors and started to try to formulate a recipe to mimic the famed Spiced Pecan Pumpkin Quick Bread. 6 loaves/versions later (I was determined) and I HAVE DONE IT! 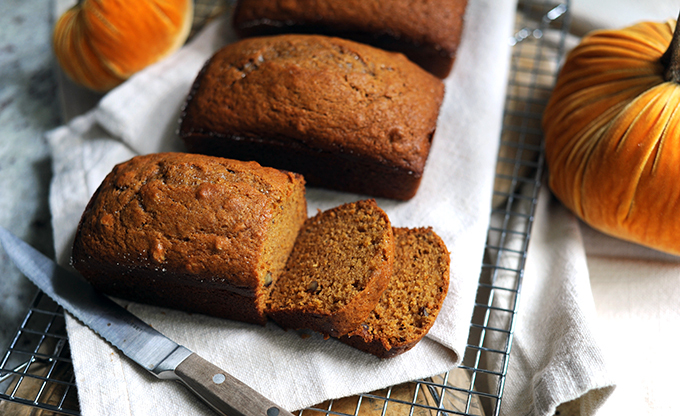 I have created a home-made recipe of Williams-Sonoma's Spiced Pecan Pumpkin Quick Bread. Not only does it taste like the store bought mix, it only costs $4.64 to make and doesn't contain butter. Cheaper, healthier, genius! Yes, genius. Side-by-side the loaves look the same and they taste nearly identical. Now, there is the SLIGHTEST texture variation (I'm not going to lie to you). It is so slight that you will only be able to tell if you make both (the store bought and home-made), slice them and eat them side-by-side. You have to realize that the Williams-Sonoma version has been formulated to be a dry mix that can sit on shelves for two years (the bag that I bought expires in 2015). If you look at the ingredients of the mix, it uses dried pumpkin and buttermilk powder. There is a slight texture variation in the home-made version because the recipe uses pumpkin puree and fresh buttermilk which makes for a moister bread (which is why there is no need for butter). Preheat oven to 350 degrees. Grease and flour a 9 1/2 x 4 1/2 in loaf pan (or four mini loaf pans). In a large bowl, mix together pumpkin puree, eggs, oil, buttermilk, sugar and brown sugar until well blended. In a separate bowl, whisk together the flour, baking soda, salt, cinnamon, pumpkin pie spice, ginger and nutmeg. Stir the dry ingredients into the pumpkin mixture until just blended. Add pecans and mix until just blended. Pour into the prepared pans. Bake for about 50 minutes in the preheated oven (if baking mini loaves, bake for about 25 minutes). Loaves are done when toothpick inserted in center comes out clean. Eat it warm with a little bit of apple butter—Heaven. Thanks Eve for the challenge! Let me know if you have anything you would like me to make—I love a good challenge!